There is a rest house near the temple with 8 rooms. There are lot of hotels with boarding and lodging available in Tiruchirappalli city. 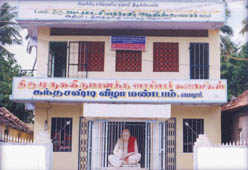 Every afternoon 12.45 p.m. Annadhanam is provided for 100 devotees in this temple. Doners are requested to donate for Annadhanakattalai liberally to feed the devotees. Two low rent Marriage halls available here. Also there is a Siddha hospital for poor people.